I have two novels in the final-draft stage, where they've been stuck for a least a decade. At some point, I shall release them to the world. You have been warned. Like many authors, I have actual file drawers filled with novels written when I was very young (and much more energetic). The technical term for such is juvenilia, but "crap" is more descriptive. My will specifically directs these manuscripts be burned upon my death. In the meantime, whenever I'm feeling cocky about something, I pull one of them out, shudder, and remember that enthusiasm is no substitute for skill. Every year I write anywhere from zero to a dozen stories under various names. I disclaim most. If you can find anything of mine in print, but not using my own name, send a self-addressed and stamped envelope, along with two boxtops, to claim your prize. Forthcoming: A collection of short stories, sure to top all best-seller lists, because, as we know, collections of short stories by relatively unknown authors always earn out. I've committed book from time to time. Most of these are out of print, but, hey, you might get lucky! I always use the name Jeffy Dwight for non-fiction books, so no boobie prize for finding anything I left off the list. Bunch of chapters here and there in various programming books. Bunch of programs, source code, and text on various programming CDs. 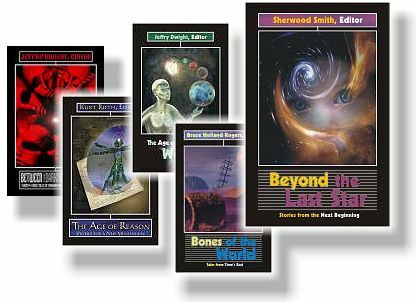 I have appeared in several anthologies, mostly between 1994 and 2004. The one with the largest exposure was probably Witch Fantastic, published by DAW Books, 1995, edited by Mike Resnick and Marty Greenberg. I also had the privilege of being the series editor for the SFF Net Darkfire Anthology Series. Some of the Darkfire books are still available from Amazon, Barnes & Noble, or collectors. The first volume was not print-on-demand, so is very hard to find. The others are still registered in Books in Print, so your local bookstore should be able to order them.